Hello online fanatics! Today I am bringing you another guest! 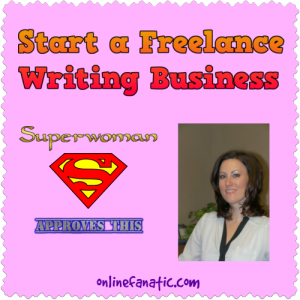 This superwoman started her own freelance writing business and has had massive success within 6 months! 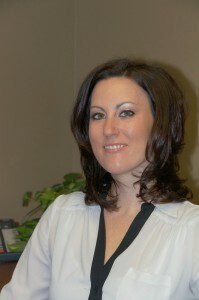 She is none other than Gina Horkey! Q1) Hello Gina! Thanks for taking the time to do an interview. Why don’t you introduce yourself to the audience and share a bit about yourself? Howdy y’all. I’m a midwestern gal (Minnesota, USA to be exact), but I really like the southern greeting! I’m a millennial WAHM (work at home mom) to two toddlers (ages two and three) and my husband is a SAHD (stay at home dad). Just two years ago we both worked in Corporate America, but have hustled hard to change that. Q2) Tell us more about building your business via freelancing writing. How does it work? Technically, I have a diversified freelance business that is made up of clients that contract with me for various services: writing, virtual assistance, business coaching, etc. I also have a course for aspiring freelance writers for the web that has done well over the last 6+ months that it’s been around. Basically, clients pay me to deliver a service. This can be writing blog posts or articles for their websites, copy for sales pages, freebies or email autoresponders and more. I also have two “high-end” virtual assistance clients that pay me to manage the frontline of their businesses by sorting and responding to email on their behalf, etc. This has been a fun way for me to learn their businesses from the inside out, while getting paid to help them become more efficient in their day-to-day operations. Lastly, I have a handful of freelancers that I coach to help them launch their new businesses successfully or take their current enterprise to the next level. This is administered through a bi-weekly Google Hangout and private Google Community. Q3) What made you transition from working a regular job to starting your own business? If you can, please share what was the biggest factor in you wanting to leave your day job. I had an almost decade long career as a personal financial advisor. While I enjoyed the work I did with clients (managing cash flow, paying down debt, planning for retirement, etc. ), I didn’t really love investing or the compliance hoops that we had to jump through just to do our jobs on a daily basis. I also worked partially as a support person to a larger practice and wanted to build my own business, not someone else’s. I had a lot of great things going for me at my previous position, but I wasn’t excited about doing the same thing for the next 20-30 years. I wanted to give something else a try – before I felt like it was too late! Q4) It must be tough raising 2 toddlers while having a full time job and working on your side business. That is superwoman status. How do you manage your time to handle all that? In short, before I quit my day job to freelance full-time, I’d get up at 4:30 in the morning to work for a couple hours while the house was still asleep and before I had to start getting ready for work at my regular job. I also worked a four day workweek and would use Fridays and some weekends to build up my side business, especially as I started to aim for taking it full-time. In essence at the end, it was like working two full-time jobs and I powered through by being mindful of the fact that wouldn’t last forever! Q5) How did you get into freelance writing? I was googling around for alternative career paths when I stumbled upon non-fiction writing for the web as a viable option. I had always paired writing or being an author with fiction novels and never really thought of making my writing hobby into a lucrative career. There is a ton of opportunity to freelance as a writer or otherwise today. It’s just knowing where to look for work, how to network and being diligent in your approach. Q6) I love your site name – HorkeyHandbook. Upon landing on the site I thought I was about to get a handy cheat sheet on blogging and writing. 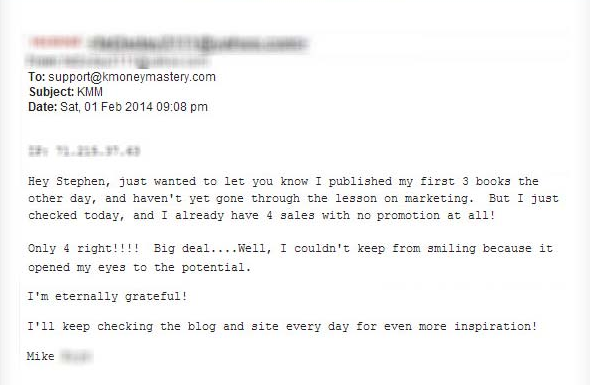 I wasn’t too far off and you offered valuable advice on building a business with freelance writing. Did it take you long to come up with that name? Hopefully in the next year, we’ll finish our pullbarn (large outdoor shed) and Wade will have a heated place to work in the winter building custom wooden tables (think farm dinner tables, etc). It’s our goal to always remain self-employed! Q7) I noticed that you are excellent at getting clients, which is what most freelance writers struggle with. What are 3 actionable steps a writer can do to help them land more clients? Your activity has a lot to do with your success and results. I used to pitch at least 10 writing jobs per week. I actually started doing that again recently, as I’m in the market of taking on one or two ideal clients. It might take some time to get that snowball building, but it’s great when it starts to click and you’ve got momentum on your side. Start pitching regularly and tracking your results. Spot check from time-to-time if you’re not getting the results you want. Q8) Now that you run your own business, do you still “work” the standard 9 to 5 schedule? Kind of. I probably work more than ever, but it’s something that I enjoy. I have to be cognizant of maintaining some semblance of “work/life” balance though. Even though I no longer set an alarm, my day usually starts pretty early. I usually wake up at 6am or before and if the family is still asleep will start working until they are up. The we have breakfast together and I usually officially start my day around 8am. I do come in for lunch and to help lay our kids down for their daily naps each afternoon though and that’s one of my favorite parts of the day. I also have the flexibility to do things during the week like running errands, taking them to the beach, etc. In theory, it’s the best of both worlds! Q9) Are there any helpful tools or resources that you use to help take your business to the next level? I’ve recently started using Trello for managing my tasks/schedule. I’m also a big fan of the Pomodoro Technique to keep myself on track during the day. And inbox zero is a daily goal of mine! Q10) Is there anyone that influenced you to start your own business? I’ve always been in sales and had an entrepreneurial mindset. I don’t know if there’s any one person that influenced that, but my husband, friends and family have all been supportive. And I’ve had a few formal and informal mentors that have their own freelancing businesses that have egged me on and helped me to hang in there when times were/are tough. Q11) What were some lessons you learned going from $0 – $6000/month in such a short time with your freelance writing business? I guess you have to keep taking action, keep learning and keep trying new things. I’m a recovering perfectionist, so sometimes I get paralyzed by that, but you just have to keep taking the next seemingly right step. Even if they’re small steps at first, as long as you keep taking them, you’re moving forward and will get somewhere sooner than later. Q12) Have you ever thought about either outsourcing or hiring a few extra writers for your business? I actually have a friend that is starting today to help me format and edit some of my posts. This will hopefully free me up to write more and take on additional clients. It’s hard for me to give up control though. This is hopefully going to be a great step in the right direction! Q13) What are some advice you can give to newbies that are looking to get into freelance writing? Just get started. Don’t wait until you have the perfect sample, website or resume. Instead, start looking for writing work and guest posting opportunities and put yourself out there. What’s the worst that can happen? I want to thank Gina Horkey for taking the time to take on this interview. For those that are interested in starting their own freelance writing business, Gina does offer a course that shows you exactly how to do it. You will get a breakdown on how to do it step by step in 30 days or less. Click the picture below for more information. Thanks for having me Kenny! If anyone has any questions, I’ll try to answer them in the comments:-).